On Wednesday, March 21, we lost our cable broadband internet connection here at the EE Daily News. Power cycling our Netgear CMD31T DOCSIS 3.0 did not help, as the modem continued a futile attempt to synch up with Comcast servers. The company's field technicians had just been out to repair cables and adjust signal strength in our neighborhood a few days earlier, so our initial assumption was that the connection failure was related to that work. Comcast sent out a technician once again, but not until the next morning. Immediately upon his arrival, Comcast's technician informed us that he had some bad news. "Netgear CMD31T modems are not designed to work in California", he said, adding that they are only designed to work with Time Warner Cable systems. The technicians had just been informed of this in a meeting they had that morning, he said. We had installed our Netgear CMD31T more than two months earlier, and it had been connecting to Comcast just fine up till then, so what had changed? We checked Netgear's documentation on the modem, and found that Comcast had their facts backwards. 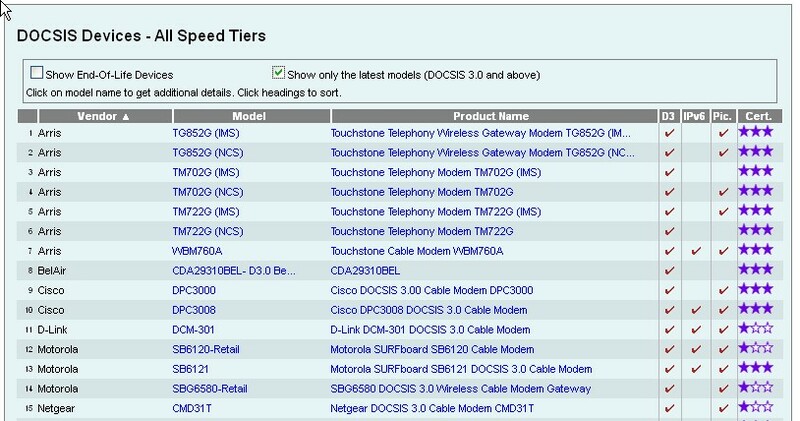 According to the CMD31T Data Sheet, all major providers except for Time Warner, are supported. It could have been that the out-of-specification signal levels on the local cable caused the problem, perhaps resulting in damage to the modem. So, we visited our local Frys Electronics store to attempt an exchange. "Let me guess.. Comcast. Right?" Apparently we were not the only ones affected. These are the exact words of the Frys Return Desk staffer, immediately upon seeing our CMD31T. "We must have had twenty of these come back just yesterday, and more the day before", he said. He kindly accepted our return for store credit, however, even though we were past the normal return period. In looking for a replacement, we learned that the Netgear cable modem was now the only cable modem that particular Frys store sells. Pretty odd, for a modem that is "not designed to work in California". Since there was no other choice, we decided to do a straight exchange for another sample of the CMD31T. Upon installing our 2nd Netgear modem, we observed from the front panel lights that it very quickly established an internet connection, within minutes after startup. To check, we executed an ipconfig command from our PC, with the results shown above. Clearly, there was no electrical problem in the cabling. Nor was there any problem with the modem, dispelling Comcast's claim that they don't work on their system. The 2nd CMD31T had no problem at all seeing Comcast's servers. To confirm that we had a good connection, we pinged Google.com, successfully. In order to completely restore our service, the next step was to call Comcast to "provision" the modem. The process requires providing the MAC address of the modem, so that it can be added as an allowed connection on the company's network. We monitored progress while on the call with Comcast, by continuing to ping Google.com. Ping request could not find host google.com. As soon as Comcast's Customer Service person completed our modem setup, we were once again cutoff from the internet. It was now apparent that Comcast is blocking the MAC address of the Netgear modems, though the devices have no problem otherwise in establishing a connection on their network. Our next step was to contact both Netgear and Comcast media relations departments, to investigate this matter. If the unsolicited report that we received at Frys was correct, an unknown number of Comcast customers were suddenly being forced to purchase new modems... with no explanation or forewarning from Comcast. As of this writing, Netgear has not yet responded to our request. We did get a response from Charlie Douglas, the Senior Director of Public Relations and Communications at Comcast Corporation, in Philadelphia where Comcast is headquartered. Here is a webpage that lists all the compatible devices we support. As you'll see, we support the Netgear DOCSIS 3.0 CMD31T cable modem. According to Douglas's initial response, there should be no problem using Netgear cable modems. In fact, the CMD31T is on the approved device list! 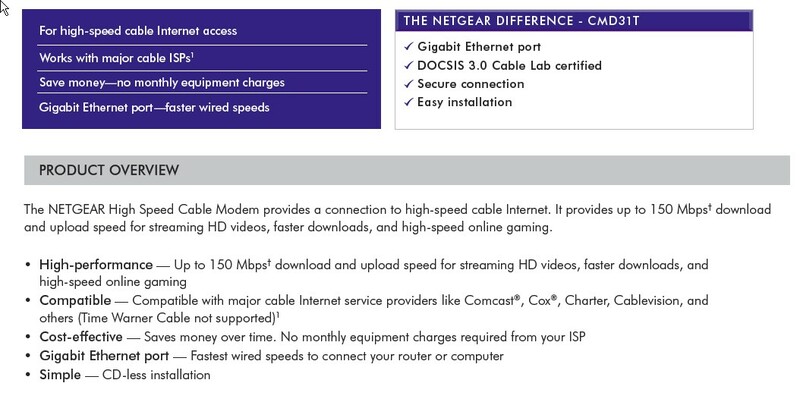 We have an approved modem, which our current test (and prior months experience) shows is completely functional and capable of providing a high-speed broadband connection on Comcast. But Comcast in the San Francisco Bay Area is rendering these devices unusable. Why? Has there been some sort of falling out between Comcast and Netgear? We are currently waiting for an answer. On Monday, March 26, we once again contacted Mr. Douglas, who had promised to investigate further. The answer we received did nothing to settle the matter, as Comcast has now "passed the buck" back to Netgear. (EE Daily News) Has your investigation uncovered an explanation for the Netgear modem issue? (Comcast) We have and Netgear plans to contact you. I have passed along your contact info. Pls stand by. You should hear from them shortly. Many questions remain. If they have uncovered an explanation, why has Comcast now decided not to share it with us? Comcast could conceivably be liable for the unnecessary expense of many returned Netgear CND31T modems. We will update this story as soon as we get new information. Users report same problem with Comcast-Netgear, on the Netgear user forum. "Last week Comcast upgraded their Cable Internet head-end systems in select cities which caused the Internet connection failure for a few customers who had the NETGEAR CMD31T Docsis 3.0 Cable Modem. We were immediately in touch with Comcast regarding the issue and within a day corrective action was taken. Comcast had rolled back to the older system and all customers were online. We are working closely with Comcast to ensure that customers do not face Internet disruptions for any such future upgrades to the system." No word yet on how Comcast and/or Netgear will compensate customers for the expenses incurred for unnecessary modem replacements. Most likely both Comcast and Netgear are not going to reimburse anyone for the cost of modem replacement since the modem now is operational and able to be used once again on Comcast's system. I completely understand how these customers must have felt when this happened but it is not either company's fault for customers jumping the gun. What should have been done was either Comcast or Netgear send out a notice to retailers in the affected areas about the problem so that when customers come in to do a return, they would be told the problem is temporary and not to return the modem. At most, Comcast might issue a small credit on affected customer's bills in a good faith effort (or public relations move) although the logistics of them figuring out which customers have that particular Netgear modem and not a different Netgear modem and figuring out which customers had that particular Netgear modem prior to exchanging for a different brand, seems very difficult task. Mike Wolf - thanks for your comments. However, you are incorrect in your statement regarding "customers jumping the gun". Comcast representatives specifically told customers who reported problems with the Netgear modem that they must purchase from a different manufacturer, in order to restore their service. In our case, the technician even told us to go to Best Buy rather than Frys. 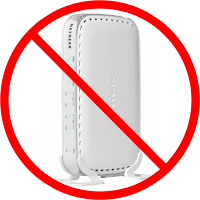 As we documented in this article, we tried another Netgear modem more than 24 hours after the Comcast disconnect, and the problem persisted. At that point Comcast knew what the issue was, but they did not communicate it to their customers. Thanks Jeff. Unfortunately, while I uncovered the truth that Comcast was initially unwilling to share, users of the Netgear modems still are stuck with the unnecessary costs of replacement due to Comcast's actions. I'll check out your tip on Sonic. However, if that is DSL only, probably not viable as an alternative in this part of San Jose. AT&T could only offer the lowest speed tier (<1Mbps) due to distance from C.O. and wiring. Funny thing is Comcast wouldnt even let their customer support know about this problem. They just insist on sending a technician out ($50) to check your lines when it was their upgrades. I have this modem... and it's a brick right now. I have some pretty interesting online chat's arguing about service interruptions with customer reps. I even called them up talked to a supervisor which knew of the problem but still wanted to send a technician. Comcast has screwed me really good. These reports the the Netgear modem still does not work are contradicting what they and Comcast have said. Mr. 'Lethal' do you have any documentation of your discussions with Comcast that you can share? You can email me directly. I have a netgear cmd31t cable with comcast, and it was working just fine for a year. I moved from Sunnyvale (CA) to Cupertino (CA), and now it stopped working. After 5 support calls with comcast tech help and after a couple of escalations, I am still without internet. I am repeatedly being told that "your modem is blocking our signals, the signal is not going through". In the last call, I was told to try replacing the modem. Comcast support definitely did not mention anything about netgear cmd31t not being supported etc. I found this link on my own. Like everyone else, I purchased this modem since it was on the suggested listed of modems from comcast. If comcast knows this issue and if it's not their fault, why is it not a part of their customer-support trouble shooting tips? This is extremely disappointing and frustrating. I wonder why it worked in one city and not in another. I would _hate_ it if they make my purchase another modem. 07092013: Comcast strikes again in the Nashville, TN market. Though I went through their "online chat" session for more than 3 hours, there was never any reference as to where or from whom to purchase the replacement except directly from Comcast. 2)the abrubt discontinuation of service to the Comcast internet customers across the US with no warning. Why?? This issue disrupted communication channels on so many levels for me personally, and may impact other subscribers in a detrimental /adverse way as well. It is inappropriate for subscribers to be held "hostage" to the changes at Comcast and then being forced to buy new equipment due to their changes. Most in Communications and IT know that it is inappropriate to "test" systems in a live environment without prior notification and approvals received in advance!